This is a crazy book too, of which I am very fond, for its originality - major originality. I found it chaotic to read the first time, but not the second. He has a few weird theories. I disagree madly with one or two. For me, though, he has three pages on Mongol religion that are beyond price - absolutely unique. For you - God knows what you might find in this flight of adventurous scholarship. What's it about? Ah... Christianity on the steppe, might be the main topic - an investigation into the little-known fact that most of the steppe was Christian, on the eve of Chinggis Khan's conquests. Great stuff in here, and so worth a go. Sign into Goodreads to see if any of your friends have read Searches for an Imaginary Kingdom. Reading this review reminded me that I need to dig out Realm Of Prester John (1972)by Robert Silverberg again and remind myself of his hypotheses. Wondered if you'd come across this. Chris wrote: "...I need to dig out Realm Of Prester John (1972)by Robert Silverberg again... Wondered if you'd come across this." I haven't, no, but I'm curious. I've found the book; sounds like he follows the legend in its several settings. 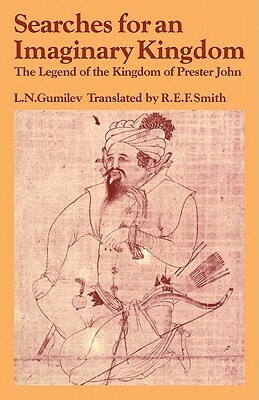 Gumilev uses the legend to examine what truth there was behind Prester John's setting on the steppe. The title may even mislead. It's about the Christian steppe kingdoms, in one sentence. The idea was less daft than we think; Nestorian Christianity was popular on the steppe while the Crusades were going on. Under Chinggis Khan I believe they had a 'native religion' revival. It's also about the Crusaders' reluctance to have help from the east: Europe pushed the idea, the Crusader states were happy to stay in charge. Says Gumilev.